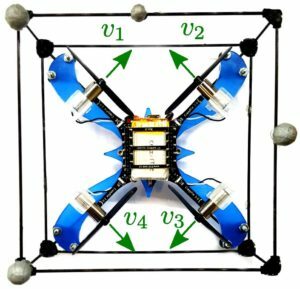 Recent work in the field of bio-inspired robotic systems has introduced designs for modular robots that are able to assemble into structures (e.g., bridges, landing platforms, fences) using their bodies as the building components. Yet, it remains an open question as to how to program large swarms of robotic modules so that the assembly task is performed as efficiently as possible. Moreover, the problem of designing assembly algorithms is compounded by the scale of these systems, and by the lack of centralized guidance in unstructured environments. The main contribution of this work is a decentralized algorithm to assemble structures with modular robots. Importantly, we coordinate the robots so that docking actions can be parallelized. We show the correctness of our algorithm, and we demonstrate its scalability and generality through multiple scenarios in simulation. Experiments on physical robots demonstrate the validity of our approach in real-world settings. In our experiments with actual robots, we designed a holonomic square modular robot based on the Crazyflie aerial vehicle platform. The robot has four propellers which are oriented to generate thrust in the plane. In this way, the robot can move on surfaces with low friction, or adapted to maneuver on water. In order to determine the robot pose in space as well as relative locations for docking, we are using a motion capture system (VICON) operating at 30 Hz. All commands are computed in ROS and sent to the robot via radio at 2.4 GHz. The docking mechanism is based on passive actuators which in this case is composed of sixteen magnets located in the corners of a cuboid cage. In this paper, we presented a decentralized algorithm to assemble structures with modular robots. Our approach drives the robots to autonomously assemble a structure in the planar space. Since docking actions are a bottleneck in the assembly process, our algorithm parallelizes these actions while avoiding collisions and undesired attachments. We show the generality of our algorithm using simulations. Through experiments with actual robots, we show that our algorithm can be deployed in real-settings. D. Saldana, B. Gabrich, M. Whitzer, A. Prorok, M. F. M. Campos, M. Yim, and V. Kumar, “A decentralized algorithm for assembling structures with modular robots,” in 2017 ieee/rsj international conference on intelligent robots and systems (iros), Vancouver, Canada, 2017. Jul 23, 2017 | Filed under Modular Robots and tagged with brunogabrich.